as part of the Native & Traditional Breeds National Show & Sale. A fascinating and enjoyable two day event for all those interested in rare and traditional livestock. A newly formed herd of Bagot goats owned by North Norfolk District Council are successfully helping with the management of unwanted scrub. See link below. Meet Bagots on the RBST Cornwall Support Group stand at this year’s Royal Cornwall Show (9th, 10th and 11th June 2016). Another successful RWAS Spring Festival for the Bagot goats. These two beautiful and very well behaved females from the Northop herd attracted a great deal of attention from the public. Following the show the Society has received a number of enquiries regarding the purchase of Bagot goats and membership of the Society. A big thank you to Wendy Gacem (our Treasurer) and her team from Coleg Cambria for being on-hand over the two day event to answer questions about the Bagots. 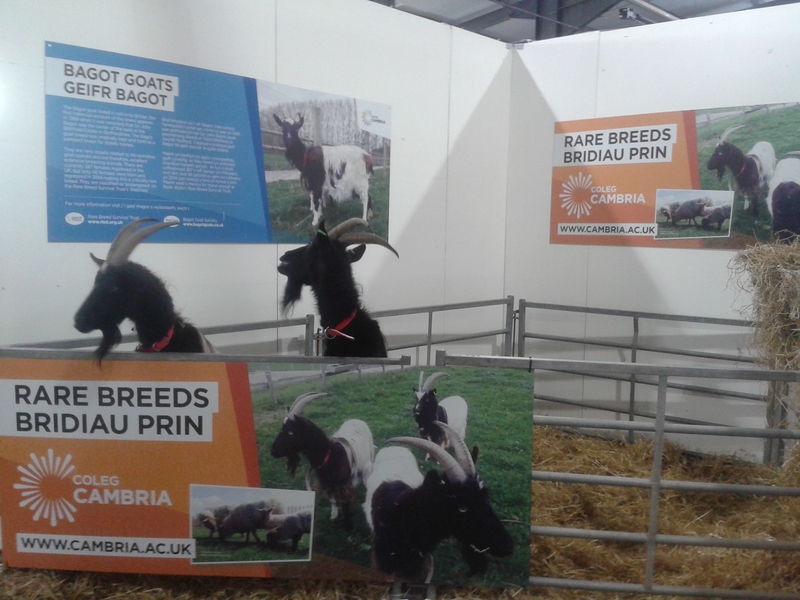 Coleg Cambria’s Bagot goats helped out on their stall at the Royal Welsh Spring Festival on the 16th & 17th May 2015.